What's so special about a train station? Well, the Fulton Street Transit Center is not just any old train station. It's a work of art made of glass, steel, and state of the art digital displays that allows you to make a connection between 9 different subway lines (the 2, 3, 4, 5, A, C, J, Z and R trains) without having to pay any additional fare or face the elements. The transit center has ten escalators and fifteen wheelchair accessible elevators to ferry you up and down its 3 levels. It also has a slew of Metrocard Vending machines, metrocard readers and 16 interactive On the Go! Kiosks that allow you to plan your trip on the subway system with ease. And of course there's welcome presence of a human being in a token booth to give directions when needed. 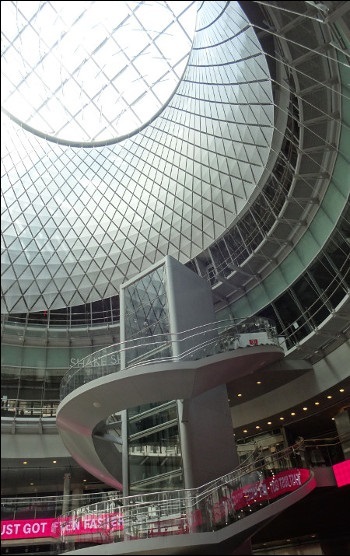 The Award Winning Architecture - The highlight of the station is the 53-foot-diameter glass oculus, called the "Sky Reflector-Net", that hovers above the grand atrium. It's a spectacular piece of architecture that allows natural light to flood down into the station. It's truly amazing to behold. Shopping & Places to Eat - The transit center has nearly 66,000-square-feet of commercial space which means that many eateries and shops will come online. It's already confirmed that Shake Shack will opens its doors at the Fulton Street Transit Center in 2016. Public Restrooms - When you're visiting New York City and find yourself a long way from your hotel, knowing the location of a clean restroom is some valuable information you might need in a hurry. 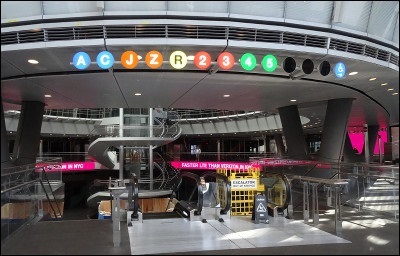 The Fulton Street Transit Center has two ADA accessible restrooms on the concourse and street levels. Take the 2 or 3, 4, 5, A, C, J, Z and R to Fulton Street. The Fulton Street Transit Center open to the public on November 10th, 2014. It took 10 years to build at a cost of $1.4 billion. It integrates five subway stations and will eventual expand to include transfers to the 1 train at Cortland Street. Once the World Trade Center Complex is complete, there will be a free transfer to the E train and access to the Path Train to New Jersey. The "Sky Reflector-Net", which is the glass and steel sculpture that hovers above the transit center's atrium, is made up of nearly 10,000 stainless steel components, 112 tensioned cables and 224 high-strength rods.